You know what you should make? I really think you should make these. They would be so good. And then we repeat the same conversation the next day. I was getting tired of it. I caved. So, these fudgesicles are for you, Jacob. Actually, I think I owe Jacob a thank you. Because these are really yummy. 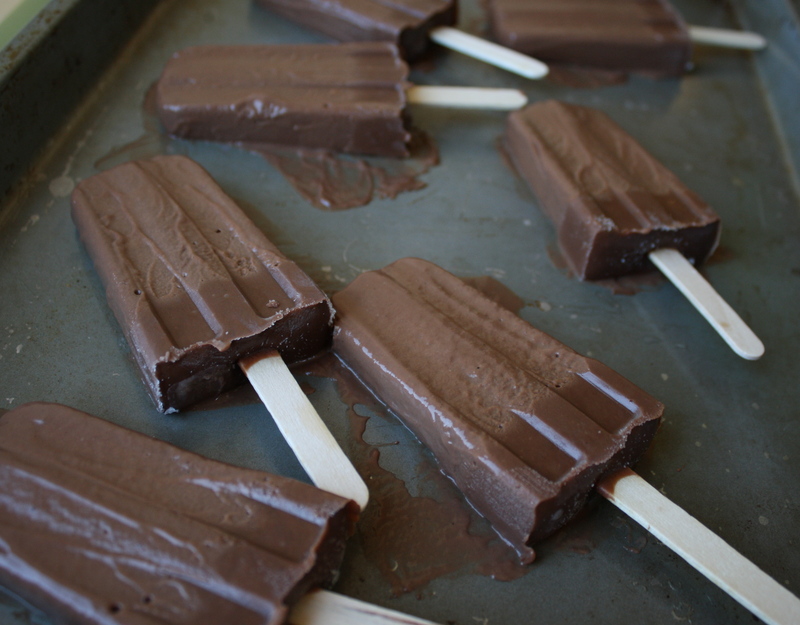 Whenever I think of fudgesicles, I think back to summer camp. Every day before we’d go home, we would get ice cream (usually on a stick). My favorite was the vanilla ice cream dipped in chocolate; others liked the cherry double ice pops; but by far the most popular were the fudge pops. When I started working as a counselor, I actually feared these treats. I loathed the day the Good Humor truck would deliver boxes upon boxes of ice cream, because then, then, I knew the kids would swarm. I don’t think I can accurately depict my terror handing out ice cream. A mob of little children, ages 5-10 rushing towards me, grabbing and ripping ice cream from the box that I clutched onto for dear life, trying to get the fugesicles before they all ran out. Luckily, with these, you don’t need to fight for one. I mean, you made them, after all. And they taste better, too. 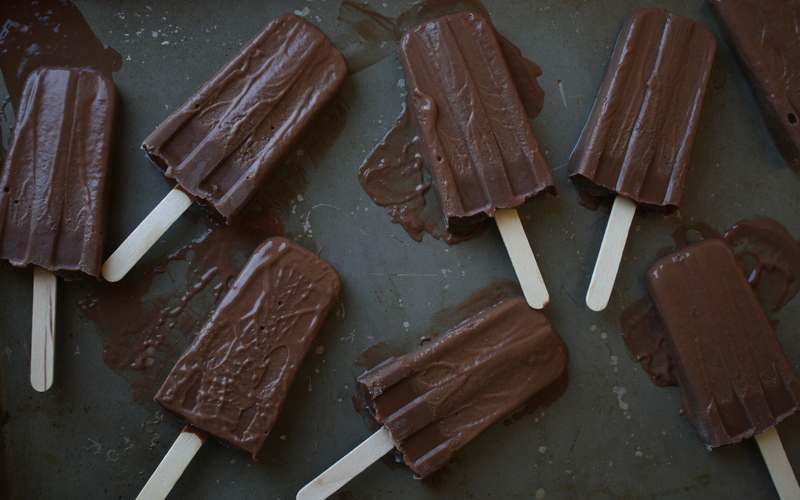 These fudgesicles are chewy and chocolately without being overly rich. I was skeptical about such a small amount of chocolate, but the chocolate flavor was definitely present. If you’ve ever made pudding, you’d know that basically all a fudgesicle is, is frozen pudding on a stick (this blew my mind). These are suuuper easy to make but also really impressive. Please make these before the heatwave passes! 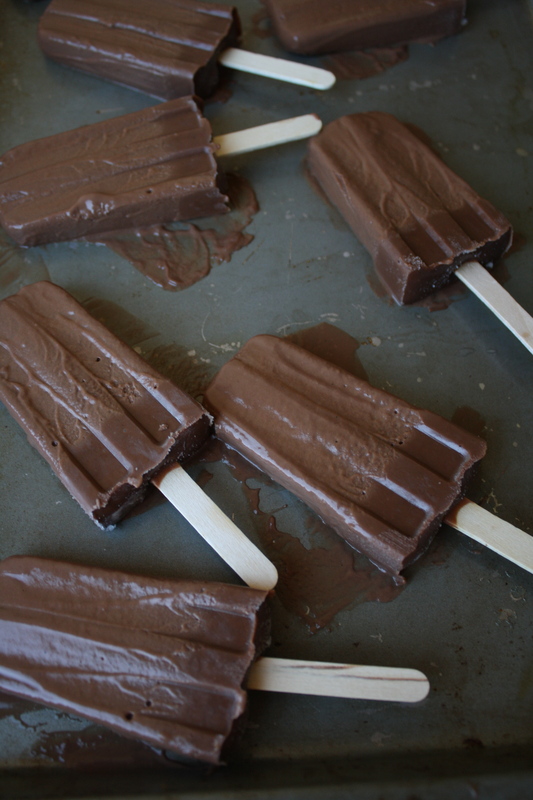 These classic fudge pops are chocolate, chewy, and great for a light hot summer treat! On the bottom of medium sized sauce pan, over low low low heat, gently melt the chocolate. Stir very frequently, careful that the chocolate doesn’t burn. Whisk in the sugar, cornstarch, cocoa powder, salt, and whole milk. Raise the heat to medium. Cook the mixture, stirring frequently, until it thickens, about 10 minutes. This seems vague, but it will be very evident when it thickens. Remove from heat and whisk in the vanilla and butter. Set aside to cool slightly. Pour into popsicle molds, leaving about 1/4 inch of space at the top to expand as it freezes. If your molds have a lid, place the lid and the popsicle sticks in. If not, let freeze for about 30 minutes and then insert your stick. To freeze, place in the coldest part of your freezer and wait until fully frozen before serving.